The dog-food smell was overwhelming, I tell ya…. and the after effects too… we feared a visit from epidemic control team with the weird niff in my bedroom…. Bean Boozled Jelly Beans are on the doping list for the owlympigs too…. 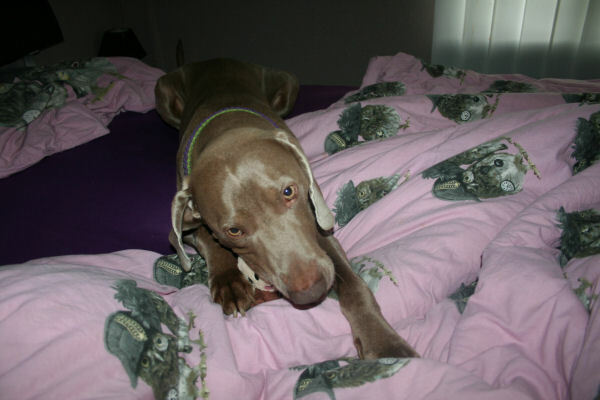 Posted by easyweimaraner on June 27, 2016 in animals, backyard, balls, Blogville, Braque de Weimar, chien, Crime, DAD, DIET, dogs, endless wisdom, Family, food, pets, weimaraner, weimaraners, writing and tagged Animal, Braque de Weimar, Brittany, Dog, dogs, Easy Rider, endless wisdom, Family, Friend, pet, pets, poison, Weimaraner. Too bad your Dad stole all those jelly beans for himself but maybe it’s for the best – you don’t want to wear yourself out BEFORE the tuneful competition right? 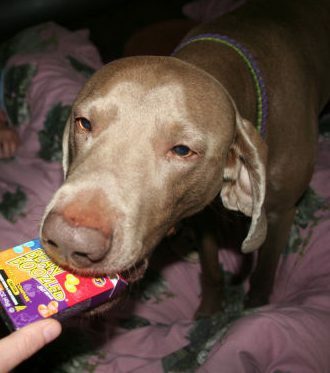 Didn’t your dad even save the dog food jelly beans for you?? He must’ve been hungry. Reaaallllly hungry! I hope daddy isn’t your competition for your event.. he’ll make colorful music with those beans! My mom will eat a whole bag of jelly beans too. She loves that kind of stuff! I once saw on TV that that’s how a momma bird fed her babies. Is your dad a bird or just kookoo? kookoo I think…. he ate all the beans with dog food…. how mean huh? Haha love it! The video was cute, easy wanted them!!! The jelly belly plant is here in Wisconsin. I haven’t ever visited it yet. Heavy I wonder if toooo many jelly beans cause tuneful events!? LOL LOL was that the auto-word thingy? Is there a safe in your crib, Easy? As I see your dad’s facial expression while eating those yummities, I’m afraid he might snap up dog food. LOL too funny. Jelly Belly comes up with weird flavors. I used to buy odd ones for my nephew when he was young. Never saw those flavors though. Loved the videeoh, Easy! I am intrigued over Tuneful Farting!!! pFor some reason Classical Gas comes to mind Easy! BOW WOW, the Pawlympics will be fun! You want to see a bird farting? They’re called jets. Poor Easy, Dad is teasing him again. Oh, the humanity of it all! We are THANKFUL that there is a BIG OCEAN between US and your DAD, right now. PeeS… Ernie is practicing his E Flats and I am TUNING Up my F Sharps… Just sayin. Shame on you Dad for not sharing!!! Our Mom has discovered the delicious ness of gummy Starbursts – she has almost devoured a whole bag – good thing the grandkids are here to get some too. Bwahaahaa! 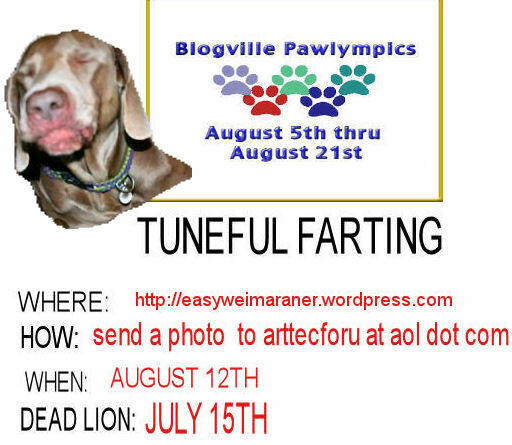 Yeah, we think those might give an unfair advantage to the entrants for YOUR Pawlympic event! We think your dad was torturing you. Isn’t that illegal in France? HaHaHa! I loved the way you looked at the camera dear Easy in the video, I swear you rolled your weimeyes at Dad! We can’t believe your dad ate all those yuckie jelly beans. He should have given you the dog food one for sure. What??? I don’t farts!!!!!!! BOL! okays, YES I do!!! lots!!! butts they smell like roses and sunshine! And Ma always gets so happy abouts them that she squeals and runs for joy! that’s my story, and I’m stickin’ to it…. Can’t believe your dad would tease you like that. Mabel was barking back at ya! OMD..the nerve of some Daddies!!! None for you? Thats outrageous!! Edward would win a gold medal for that sport. Did the man share the beans? Jelly beanss have a weerd effect on LadyMum all so. Mee scratchess them off thee groceree list ALOT! Were they Jelly Belly jellybeans?